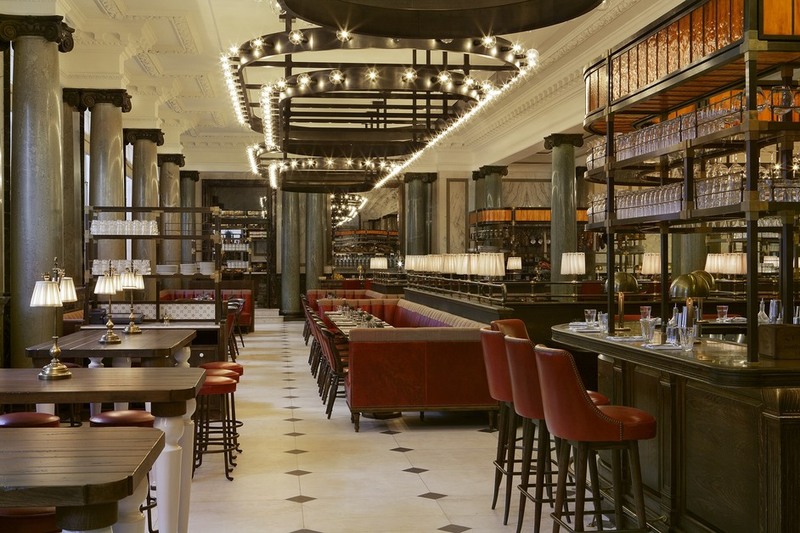 The launch of the luxury Rosewood London on High Holborn was one of the new hotel highlights of 2013, and from February 2014 the hotel's in-house restaurant, the Martin Brudnizki-designed Holborn Dining Room, welcomes its first diners. Rosewood is renowned for designing its hotels according to location and the Holborn Dining Room's nod to Britain comes in the form of mini milk bottles as vases and custard vessels, banquettes made to look like park benches, and seat covers in London bus red. The menu, overseen by Executive Chef Lee Bull, includes traditional British dishes such as lamb chops, corned beef hash and hock & coq pudding, all made from the finest locally sourced ingredients. And with former Ivy Head Chef Des McDonald, whose first restaurant was The Fish & Chip Shop in Islington, at the realm, the fish and chips served with mushy peas is one of the obvious menu highlights. High tea is also available, with a selection of sandwiches, Welsh rarebit, cream tea and a daily changing cake menu. Holborn Dining Room gyms, sporting activities, health & beauty and fitness. The best pubs near London Holborn Dining Room. Holborn Dining Room clubs, bars, cabaret nights, casinos and interesting nightlife. Where to have your meeting, conference, exhibition, private dining or training course near Holborn Dining Room. From cheap budget accommodation to luxury 5 star hotels see our discounts for Holborn Dining Room hotels, including Club Quarters Lincoln's Inn Fields from 77% off.